Gorgonzola Naturale Cheese for sale. Buy online at Zingerman's Mail Order. Gourmet Gifts. Food Gifts. Extra matured blue cheese from Lombardy. Next to Parmigiano-Reggiano, Gorgonzola is Italy's other most well known cheese. And not without good reason. When it's good — like this — it's one of the most luscious cheeses around. Traditional Gorgonzola is made just south of Milan, in the northern area of Italy called Lombardy. That was the spot where herds of cows rested during their long spring and autumn treks to and from seasonal pastures. That meant twice a year the people in this little town were flooded with more milk than they could possibly drink. To make use of the surplus they did what almost every other traditional European culture did: they began making cheese. Eventually the cheese became known as Gorgonzola. 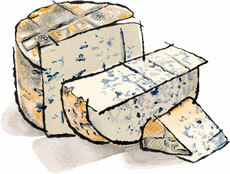 Traditional Gorgonzola is made in two styles: Dolce and Naturale. Dolce is the younger version, Naturale is the matured version. We prefer Gorgonzola Naturale for its wonderfully intense flavors.